I have written few posts in the past on Android Barcode scanner and Android QRcode scanner and received a lot of questions from readers about how to use the code in a complete application. So, I have decided to make an end to end application using QRcode scanner. Before I start, you should know that making a complete application require 40% planning and 60% coding. Let’s start with the planning phase, those who are only interested in code can skip this section. My purpose is to create something which is useful and everyone can try it, so I decided to make Aadhaar Card Scanner. Well I know not all of my readers know what Aadhar Card is, so here is a brief introduction. Aadhaar is a 12 digit individual identification number issued by the Unique Identification Authority of India on behalf of the Government of India. This number will serve as a proof of identity and address, anywhere in India. For more information you can further read on UIDAI Site. Aadhaar card is the printed version of this information on a paper card. Almost everyone in India has Aadhaar card so this app is useful for everyone in India. To make Aadhaar card machine readable it has a QRcode which contains card holder’s information. Here is a sample image. User can scan Aadhar card and view the information in the app. Scan Card Screen : This screen will come when user will click/touch on “Scan new Aadhaar Card” button. This will let the user scan QRcode of Aadhaar card. Scanned Aadhaar Card data : This screen will come when a successful scans is done. This screen will show the data scanned from QRcode. User can save the scanned data or cancel and start a new scan. Saved Aadharr Card : This screen will come when user clicks/touch on “View Saved Aadhar Card” button from home screen. This screen will list all the saved Aadhar Cards. User can delete the saved Aadhar Cards from here. Below is a simple flow diagram to understand user journey on our application. After all the decision making, now we have a clear picture of what we are making and what things will it do. This will decide the scope of our development/coding. Before we start anything, I assume readers have basic knowledge of Android application development and how to use Android Studio. Event if you don’t it is not that difficult to follow this post. So lets dive in and create our application. Home Activity : This is your first activity and by default it comes with an action bar. We do not need this action bar so add the following into your “onCreate” function. Now we need to create the layout or the front-end of our screen. Below is an image of the layout which we want to create. The layout is pretty simple. So lets create a new layout file in your resource layout folder (/app/src/main/res/layout/) and name it as activity_home.xml. This fie will create the frontend of our activity.It is a long file so I am not embedding it in this post. However you can view it on my github, please Click to see full source code of activity_home.xml on my github. scanNow (line 64): this function is attached to “Scan new Aadhaar Card” button and it will initiate the new scan. Function is defined in HomeActivity.java. //but not optimal for later Android versions. // you don't need to include this. // Convenience library to launch the scanning and encoding Activities. // Android version and what is available. // is not compatible on Android 2.2 and earlier. // you plan to support these versions. // for older Android versions. After updating the gradle file and rebuilding your project the ZXing library will be available and scanNow function will launch the camera which you can use to scan the QRcode. Now we will write the handler function which will receive the result from scan. onActivityResult (HomeActivity Line:90): this function will receive the result from the scan event. The result will be extracted and passed to another function to process the received string. processScannedData (Line : 112): This function is used to process the string received from scanning the QRcode. The string is a xml string (that is what Aadhaar system uses). We have declared variables to store the extracted information at the beginning of our activity class. There are different ways to process xml string and you can select your favourite method. However I am using XmlPullParser. Once the information is extracted we call displayScannedData function which will display the information on screen. displayScannedData : This function hides the home layout, set the value of all the extracted data to display and finally show the scanned data layout. The scanned data layout has two call-to-action (buttons) “Save” and “Cancel”. Cancel will call function showHome which will hide the scanned data layout and show the home layout. Save will save the scanned data. For saving the data we will use device Internal storage and save the information in JSON format. We could have just used xml but JSON is pretty neat and is used widely now days. To abstract the storage choice and get a flexibility to change storage to whatever I want later I have created a Storage class and defined methods for read, write and check if storage file exists. You can see the full code of storage class here. I have created a utils folder and added all the supported class files in it. saveData : this function will save the extracted data from the xml string in the form of JSON into device internal storage. For absolute beginners, I don’t want to hard-code the keys for my JSON so I have created a class DataAttributes and declared all my keys in this class. This will help me easily maintain any spelling changes in the keys. DataAttributes class is added in utils folder and included in HomeActivity. showSavedCards : This function is attached to “View Saved Aadhaar Card” call-to-action(button) on the main home screen and this will launch our second activity which is SavedAadhaarCardActivity. Below is the layout file code. I have used ListView to display the list of saved aadhaar cards. The code for adaptor used to bind the data and construct the list is added into a separate class called CardListAdapter this class is added to utils folder code of CardListAdapter can be found here. onCreate : this function will read the file from storage class and parse the JSON to construct the ListView. deleteCard : this function will delete the aadhaar card from saved list. These were the main functions which are being used in the application. However I have added few more function to navigate between the two activities. I have also added DataAttributes class in Utils folder to manage any change in xml attribute name in future. This is a simple application which saves scanned data in internal storage and display it on the screen. You can modify the Storage class to save the information in a backend service. Don’t forget to read How to write secure webservices. 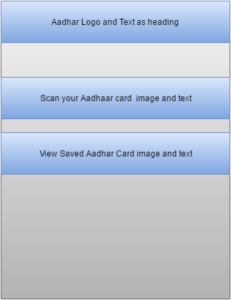 The full code for this application can be found on my Github under Android Aadhaar card Scanner. can you please tell me how to use this code in fragment. How can we insert search bar using code on my aadhar card website. You can scan the code from the app and then open your site within the app using web view. You can pass the scanned code in the URL of your site. The camera launch is failing on after i run the app through my android phone. Sorry i just figured out that my app din have camera permission on. The app is working fine. Thanks Nikhil, let me know if you need any help. This is happening even after I have added these camera permissions and features . are you testing on emulator or on an actual device ?. Also can you share the error log you get in your android studio. Errors are visible in logcat. 08-30 08:40:33.310 13286-13470/com.example.chinmoydash.aadhaarcardscanner E/libGLESv2: HWUI Protection: wrong call from hwui context F: ES3-glCreateProgramSEC. Above Message appears when the app is installed . Clicking on the “Scan new AAdhar Card ” doesnt give any message on the Android Monitor Window .only the Dialog Box appears with this message . And I am testing these on a Actual device . these things happen even after the above permission and features have been added . android.hardware.camera feature have already been added . Looking at your log there is error in function sendUserActionEvent() while accessing mView. Can you push your code in github and share the link so that I can have a look. Well I have added camera features and permissions . Rest is same as your code. Here is the link to the code on github . I will have a look at get back to you. I have built your app and its working fine on my Samsung Galaxy, also the log you have shared are not relevant to the issue. Can you save your device monitor output(in android studio, right next to logcat) and upload it as a gist( u can create gist on githum) and share the link. Hi Rajinder here are he links to snapshot of Monitor and logcat . I don’t have a device to reproduce this so you can try the solutions mentioned in the stackoverflow questions and let me know if you were able to fix it. Let me know if you need more help. you just make my day. Glad that I helped Sujeet, let me know if you need more help. Also If you want to open the QR-Code scanner in Vertical Orientation then read my post : Android barcode Scanner Vertical Orientation. for aadhar status registration and other procedure do visit my website dear rajinder deol. 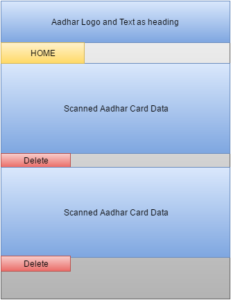 We get the data from adhaar card in my app but we want to save the image of whole Adhaar Card also. please help me with this. to save the image of aadhaar card you have to access the camera and prompt the user to click and save the image. Later you have to show this image with the saved aadhaar card information and handle deleting this information when aadhar card data is deleted. There is no one line answer to it but if you can wait, I will update the app code to include this feature over the weekend. thank you for the prompt reply. It would be better if we get updated app code. I had cloned your code from git hub but i cant able get details from QR code i can able to see yellow points while scanning but it takes to many time to scan and i cant get result can you plz help me to solve this problem. Thank you. This app works with images taken by your phone, so quality of the QR-code also matters. Try to scan the QR-code of different aadhar cards. You can turn the camera flash on by using the volume-up button on your phone. Try scanning few sample aadhar card found on google to test. The post is useful. I have a question. Is it possible to connect the aadhaar card scanner to a database like sending a query to UIDAI database after the scanner scans the QR code and returns the information about the card holder in the format of a prefilled form.? I am a novice in the field of IT and need help for my thesis. will be Thankful if you can help. UIDAI has an API end point which you can use to verify user information but there is no API to fetch user information. Due to the sensitivity of the user data you can only scan data from an Aadhaar card and send that data to verification API, the API will reply with just valid or not valid. You can not get any information from UIDAI, it will only verify if the information matches to the information in their record, it will not disclose what mismatched just simple response as “invalid”. can you please explain working of zxing api and methodology used for this project? zxing is an opensource image processing library written in Java and has its ports for other languages. This library processes an image containing barcode or QR-code and returns the result. This library has a default android implementation which uses camera with a framing rectangle to cut and extract image. This extracted image which is a bitmap is processed by the library to guess the format and data in the barcode. All this is available as “intent” so that you can directly use it in your Activity Class. Feel free to ask if you need anything else. thanks for the kind words, do let me know if I can help you in anything. glad that my work helped you finishing your project, let me know if you need more help. Hey brother, please help me to get image of Aadhar card user. Or Could i get registered mobile number?? Hey, i want also a photo of aadhar card.Is it possible? I want registered mobile number or user pic.Could you do this? you can only read the information embedded into the QR-Code of Aadhaar card and QR-code only has Name, Address and Unique ID of user. For User’s picture I am already working on updating the app to click picture of card and save along with the scanned data. Your code works perfectly. But I am in the work of expanding your codes and syncing it with the firebase database. I wish to store a particular amount to the aadhar id to scan and once i scan the card through the app, it should show my balance. How do I it? and send the UID back to firebase. let me know if you are facing any other scenario then the mentioned above. i am beginner to java…….can u help me for printing out a aadhaar text file containing details of aadhaar of a person…i want to just print to console the details in that text file in readable manner for eg: uid =: 123456789 name: xyz address:abcd and so on ……the file contains <PrintLetterBarcodeData uid = "123456789" name="xyz"
Hi, I don’t know why this app doesn’t work on both my devices. When I scan a sample card, the app comes back to the home without saving any data. there are two conditions in which the app will come back to home screen. Try to debug these two cases in your app and see if these conditions are getting executed. the aadhar data file contains data in XML format. 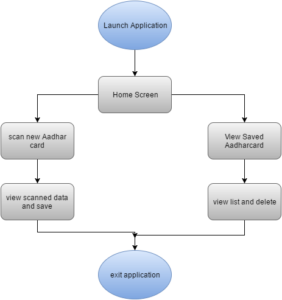 Learn about XML online and then read my post Android Aadhaar Card Scanner I have processed the XML and extracted the data. see processScannedData function at https://github.com/rajdeol/android-aadhaar-card-scanner/blob/master/app/src/main/java/com/rajdeol/aadhaarreader/HomeActivity.java#L117 I have used XmlPullParserFactory to process the XML string. Try this and let me know if you need more help. Error:(17, 0) Could not find method compile() for arguments [directory ‘libs’] on object of type org.gradle.api.internal.artifacts.dsl.dependencies.DefaultDependencyHandler. You need to add the dependency in the build.gradle file in your app folder not the build.gradle at the root. i want user info using aadhar number, eg:- i have aadhar card number while i search i need user info. Please help me for this. 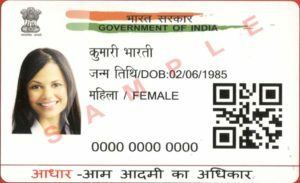 How can i get User profile picture on aadhar card in response, i am not getting profile picture url or anything else related to user profile picture. So can you please let me know that how can i get user profile url. User profile pic is saved with government and it is not embeded in the QR-code. You cannot fetch a user’s image using the UUID. I have used this code earlier only earlier it was working fine but now it’s not working crashing the application. can you share the error your are getting, can you also share the logcat output. Hi this tutorial was simple and useful thank you so much. Can you please kindly do this with google vision api. I tried but scanner is not working for aadhar card. Thanks for the kind words Anu, I can give it a try to the google vision API and share the results in few weeks. can you share more details, where are you getting your json from and are you comparing two strings ? When scan qr code Error comes “Sorry, the android camera encountered a problem. You may need to restart the device”. I try to restart a device but not working. Your Code is perfectly working and it is same as what i need with slight difference. Your code is scanning the adhar card and i need to scan qr code of a goods permit. In my requirement i need Permit Number,Permit Code,Commodity Name etc I have done the modification to my code but its not scanning. Please suggest me how can i modify?? apologies for the late reply, I was travelling. Can you share a link to your code so that I can check what all modification you have done. I am not able to resolve DataAttributes package error. its showing cannot resolve DataAttributes. can you share some more details, like the error message and file/line of code where you are getting this error. Your repo code works fine, but I have implement into my app it not works. are you getting any error? Can you share more details. so request code for scanner not works. ( OCR_REQUEST = 49374 ) if pressed the button Scanner opens but data not get from Aadhar. Can you help me? Are you review my code? Thanks for your coding , my problem is in Fragment.So as below line solved the issue. apologies for the late reply, I was caught up at work. Glad to know that you have solved the issue. All the best for your project and let me know if you need any help. How to set Camera focus on QR Code? Also If possible, capture image from Aadhar card? in case aadhaar as blow format? what we have you have any idea or suggestions ? when we are reading data created by third party(in our case UIDAI which decides aadhar card data) there will always be situations where they will change the format as per their needs. To handle cases like these, we always abstract these data identifiers into separate files so that we have to do minimal changes. In our application we have done the same and created DataAttributes.java file which is located in utils folder (github). You can simply change the values in this file and the code will work. you have any idea about in Recyclerview content convert to PDF format?